bluh » Thanks, MD ‘safety’ inspection! 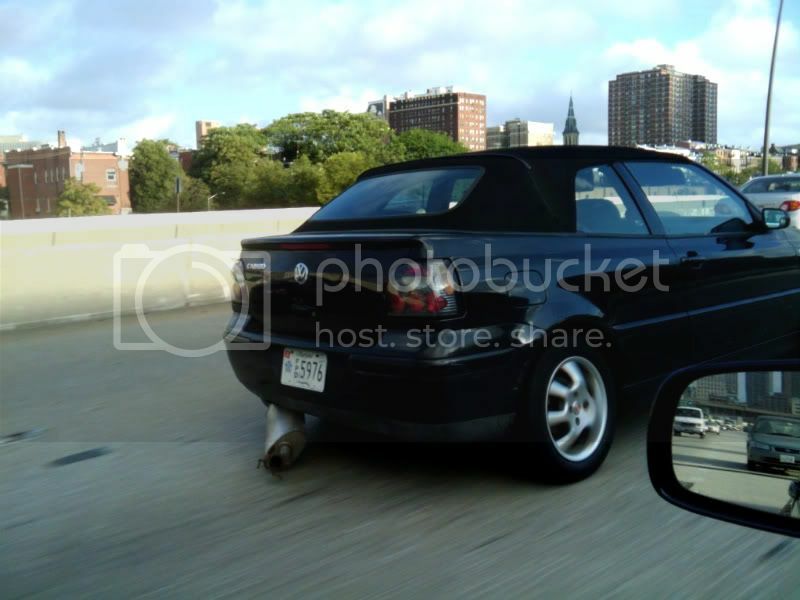 Ever had the exhaust fall off your car? It’s LOUD… all the clanging, scraping, donking & sparking. You’ll notice. The Cabrio’s driver seemed perfectly happy with this situation this morning on the JFX. Or maybe he was busy talking into his blootoof earpiece. I hope he fixed it, or at least wire tied it out of the way. The muffler I temporarily put on my Golf for inspection came loose at one end on my way home from Rob’s, but I immediately pulled into a parking lot and called for my wife to bring me the tools & ramps. Fixed it on the spot before driving the rest of the way home. It’s crap like this what kills motorcyclists. Thanks a ton, useless & ineffective ‘safety’ (State-mandated cash grab) inspection. You do realize that the plates on that Cabrio indicate it is a Frat Police Orficer? Seems like they may be able to get away with anything on the highway! I hate following behind those kind of issues, waiting for a hole in my windshield!